Ten months of struggle. Ten months of non-stop development. Very little spent on marketing efforts. The growth rate hardly dropped since we entered the market on October 2016. 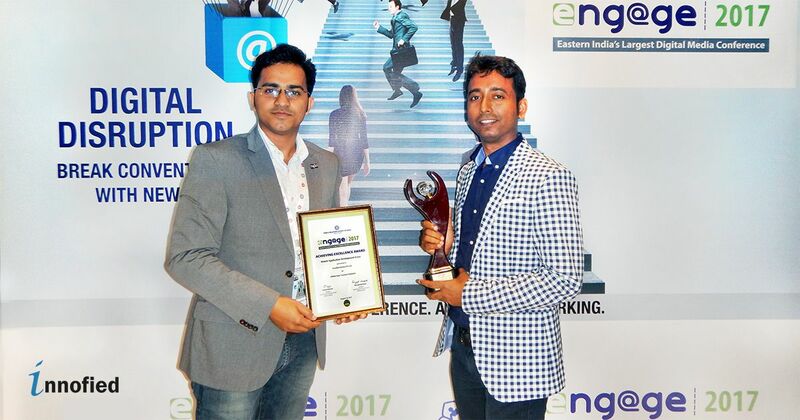 Finally, we won Engage Digital Award of Excellence 2017. Yes, we are talking about Allride Apps. The transport app solution that won appreciation on 18th August at ITC Sonar Bangla. The transport app solution, powered by Innofied. We bagged many happy customers after we launched our product. However, satisfaction, hard work, and efforts pay if we receive a reward. 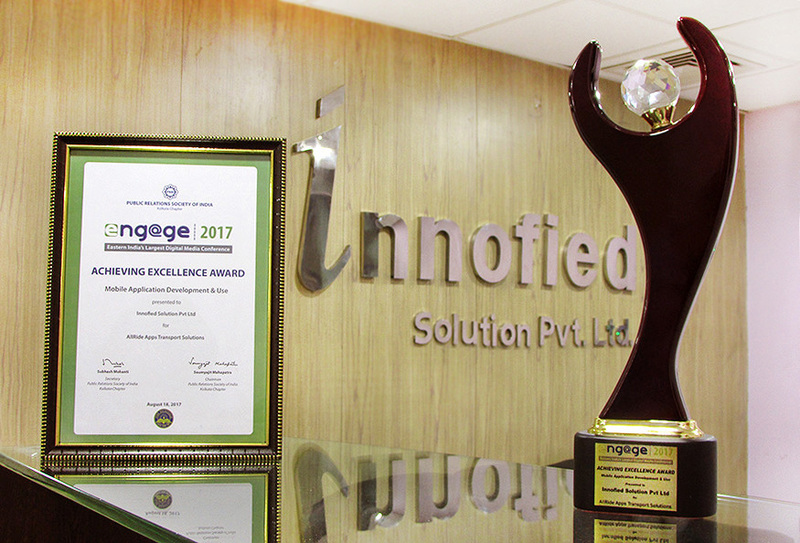 Thanks to PRSI, Kolkata Chapter for considering us eligible for the second time at Engage Digital Award of Excellence. Undoubtedly, this was our second time at Engage Digital Summit and we were feeling tensed. 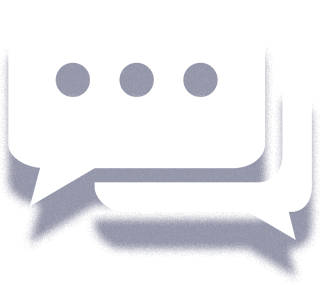 We won a good round of applause for the last year’s product Barnoparichay, so we could not just give out anything, but it should be really engaging and might showcase our hard work. So we thought to give the best shot with our transport app solution – AllRide Apps. Launched in October 2016, this is a 360-degree transport app solution, which allows transport and logistics business owners to readily built their mobile apps and admin panels to make everything automated! Held on 18th August 2017 at ITC Sonar, Kolkata was a proud day for Innofied as their hard work showed colours of excellence with recognition of AllRide Apps. Swarnendu De and Sandip Saha, Innofied’s CEO and co-founders received the award from Nivedita Banerjee, Secretary-General of PRSI. Chief Guest of the award ceremony was Mr. Debasish Sen, Additional Chief Secretary, Information Technology & Electronics Department, West Bengal. It was a great day and a big honour. There were so many competitors and winning an award among them was really a daunting task! But we made it! We waited for this for a long time. With a keen sense of UI/UX, innovativeness at every step and knowledge of every robust technology seems to be in our blood. Engage Digital Award of Excellence 2017 recognized companies who are using integrated digital technology solutions to create value for their customers. Apart from Innofied, the winners included Interactive Avenue, MaxMobility, Indus Net Technologies and others. Along with Public Relations Society of India, Engage Digital Summit had successfully arranged this giant event at Kolkata for the 6th year. So, a recognition by them was not just prestigious, but it is a proof of consistency to our clients, customers, and employees who rely the most on us. The inaugural session took place in the presence of Mr. Debasish Sen, Additional Chief Secretary to the Government of West Bengal, Mr. Soumyajit Mahapatra, Chairman, Public Relation Society of India, Kolkata Chapter, and other guests. Mr. Sen talked about digital disruption and how it has been influencing our lives. He encouraged the young people to come up with more innovations to mark the beginning of a new digital era. There was a series of other speakers session who discussed latest trends and development in Digital Marketing and how it is impacting brands. 2017 was really big and memorable for Innofied. It all began with NASSCOM East IT Award, and then came Engage 2017. A very happy year for us!